The first book in this trilogy, Pure, was one of my surprise favourites of 2012. 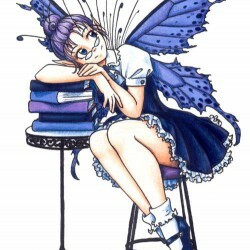 I remember picking the book up, not sure what to expect, and I was absolutely transfixed by the story. 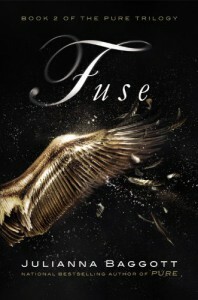 When I picked up Fuse from the library, I was expecting to be captivated in the same way, but also a little hesitant about whether my sleep-deprived brain could handle a dystopian novel (after my struggles to get through Going Too Far, I was starting to think that I might be on a contemporaries-only binge for a while, at least until Marko starts sleeping through the night).But Fuse captivated me just as much as Pure did. And I loved it.The story line picks up right where Pure left off. To avoid spoiling anything for anyone who hasn't read Pure yet, I won't talk about the plot at all, but just say that Julianna Baggot's writing sucked me into the story and refused to let me go. As I said in my bookish resolutions post earlier this year, I wasn't too sure how much reading or blogging time I was going to have with a newborn on my hands, and when I picked up Fuse, I was a little intimidated by its size (400+ pages). It took me a little longer to read than my usual speed, but I still feel like I flew through the book, reading a page or two whenever I had a spare moment. Even though that's not my usual style of reading (I'm usually one who prefers to sit down and read for an hour or so at a go), I found that this worked quite well for this book, mainly because Julianna Baggot's writing is so beautiful that you almost have to savour the words for a little while before moving onto the next section. In fact, I had a Twitter conversation about this aspect of the book: I want to purchase a copy of these books, just so that I can reread them in the future and savour each and every word. Here's an example:I feel like we weren't made for each other. We're making each other--into the people we should become.Fuse is a spell-binding sequel to Pure, and I might have enjoyed Fuse just a tiny bit more than Pure (and I LOVED Pure a heck of a lot). I'm so excited to see what the conclusion of the trilogy will bring!